When I first saw tie dye jeans in my friend's wardrobe I fell in love with them immediately. That time I thought that they should be easy to make myself and I was not wrong! So here is a Tie Dye Jeans DIY! Когда я впервые увидела эти джинсы в гардеробе друга, я сразу в них влюбилась. Тогда я и подумала, что должно быть, их довольно просто сделать самому, и не ошиблась! ) Итак, приветствуем мастер-класс джинс Tie Dye. Soak your jeans in cold water and then wring them out. Bind the jeans with several rubber bands. The rubber bands will prevent the bleach from penetrating the fabric. Using your gloves, do a 50/50 mix of bleach to water in your bucket. 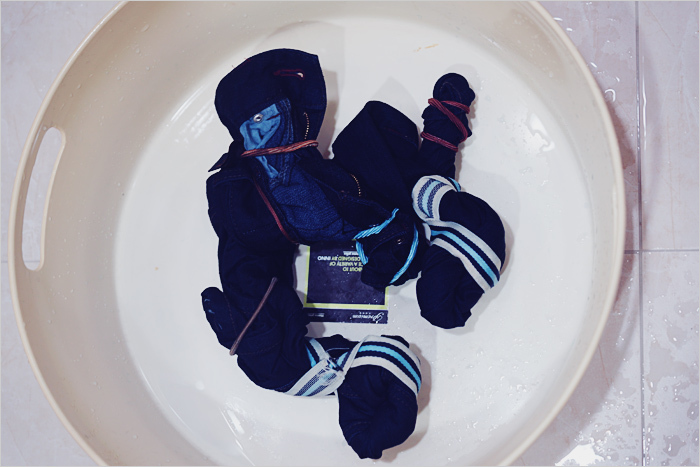 Submerge the wrapped jeans into the bleach-water mixture for 15-20 minutes. Once you're happy with the color, safely dispose of the bleach-water and rinse the jeans in cold water. Let your jeans dry and wash them separately from your other clothes. Намочите джинсы в холодной воде и выжмите их. Скрутите джинсы и перевяжите из несколькими резинками. Резинки защитят материал от проникновения отбеливателя. Надев перчатки, сделайте 50/50 раствор отбеливателя с водой и положите в него джинсы на 15-20 минут. Аккуратно уберите резинки и ополосните джинсы холодной водой. Высушите джинсы и постирайте их отдельно от всей одежды. I would like to try but I'm not so good with these stuff :)! These are awesome, thanks for sharing. I want to try this out on shorts. I like the result! I will possibly try something like this for this automn! I love them. I'm going to have to try this out! I can't believe you made these--they came out awesome! надо же как круто получилось!!! Good job. You are one brave woman. I'd be afraid to ruin my jeans. LOVE. Great post! I also love that you paired the tie-dyed jeans with a striped yellow knit sweater. Wonderful DIY! Loved the outfit too!! even your bleach bottle is cute! I like the way these came out! I have a few pairs that i can spear to do some DIY projects with. I am definitely doing this ASAP! Love!!! um where do u come up with this stuf???! you do some amaze diys. dont know what i love more this or the lace shorts. You rock miss thang!!! xO! Wow the jeans are amazing and they are only accentuated by that yellow top! It is such a great look! класссс! надо поэкспериментировать со старой джинсой! Wow these turned out amazingly! I might have to try this sometime. The end result is really cool :). I like it! I think it is cute because it looks more like a pattern than tie dye.. fabulous! how cool is that! awesome! Ольга, я в восторге! Обязательно попробую!!! LOVE this. I'm going to have to try it for sure! WOW, these are super cute and the idea is so awesome! Thanks for sharing! You're always very creative with your DIY! Wow those are actually really cool! Nice work! Following ya!